I received the following email the other day. Like me he got screwed out of a large sum of money and is doing something about it. I admit I've thought about trying to get news organizations involved to help expose Ron, but I didn't know how seriously they would take it, and I don't really have the time to follow up on it. I"m glad someone else did. Hopefully it does some good. First of all, this email is in no way an attempt of defamation of character or any attempt to provide false information of anyone, It is all true and factual information being provided to help protect other consumers from being stolen from before it's to late.I have have lost a lot of money because of Ron Janis and his company and don't want it to happen to any one else. You've taken food off my table, you've take money away from my children's education, you've taken presents from underneath our Christmas tree. I am pissed off and I've simply had enough. You've stolen from me, and I will stop at no ends to make sure justice is served. You have official messed with the wrong person Mr. Janis. As much as I would like to handle this matter more personally and one on one, I will not. That would accomplish nothing except for an immediate sense of gratification for me. That is not my goal. But I will not stop until you are behind bars and no longer a threat to anyone or their family and livelihood. This email is in reference to the one posted on 11/20/15 regarding the unfortunate victims in Addison. Let it be known that Ron Janis DOES NOT have a plumbing license of any sort. Ron Janis DOES NOT have a business license to operate in the state of Illinois. 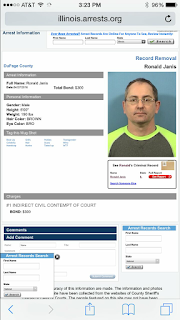 Ron Janis DOES NOT even have a freaking drivers license!If you see him driving, call the police and report him. He is unlicensed, his vehicles are all uninsured and mostly unfit and unsafe for road use. Most of the Illinois safety stickers that are supposed to be displayed on the front windshield are expired or illegally transferred from other vehicles. And on several of the vehicles, the license plates are not even the correct ones for the vehicle. He has bounced several checks to the State of Illinois and has a ton of I-Pass violations and cannot register or legally plate any of his vehicles. So he just uses any license plate that has a current sticker and puts it whatever vehicle he plans on driving that day. If you see him on the road, CALL THE POLICE! As a matter of fact, call the police on any Private Water and Sewer truck or van if you see it. They are all illegal and need to be removed from the roadways. This guy needs to be stopped from ripping off hard working people just to keep his sham of a business on life support. He currently has several court cases pending due to him driving with a revoked license as well as operating a business in Addison with no license. If he gets caught again it will not be good for him. He lives in Lombard and commonly drives a ugly pink van that says Private Sewer on it and he also drives an equally ugly blue and green van. He is always talking on the phone when driving and can't be missed, If you see him, report him! You could be saving someone from getting ripped off on their sewer and or water jobs just like we all have. Enough is enough! Together we can stop this thief and expose him like he needs to be. And one final note, beyond the constant repossessions of vehicles and equipment, he also is in the process of losing his own personal home. And what makes this even more pathetic, he had his house put in a family members name because Ron has the credit of a 2 year old and couldn't acquire a loan, plus, he is so ridiculously in debt to Uncle Sam, he can't put anything in his name anyway, or else it would be immediately seized. So what does our good pal Ron do? He suckers a family member into putting a house in there name and says he'll make the payments, only to default and destroy their credit. Way to go Ron...it's one thing to ruin your own life, but to destroy that of a hard working family member that trusted you? How you sleep at night is a mystery to us all. You deserve to rot in prison, removed from society and from the decent, honest hard working people of America. You are the problem, and you make us all sick. If everyone would start reporting Ron and his criminal activities to the States Attorney, Lisa Madigan, justice will be served. He will go to prison. This website is a good start but the proper authorities need to be notified! Ron thinks people are stupid and won't take the necessary measures to make a difference. PROVE HIM WRONG! People do not deserve to be ripped off any more. Let's put this guy away. I am in the process of telling my story of being ripped off for over $11,600 to every major news outlet in Chicago as well as telling them about this website and having them informed on all the others that have been stolen from. It is possible to recoup what we have lost from Ron Janis but we all need to act together and speak up! Do your part and report your case to the Illinois Attorney General and let's put an end to this scumbag and his so called attorney "friends" that he conveniently befriends in order to try and get free representation. We are on to you Ron, and so are they. So far, Fox Chicago and CLTV have responded and requested more information regarding the amount of people affected and dollar amounts. It's just a matter of time. Please do your part and help save the next unexpecting homeowner from getting ripped off. We all work too hard to deserve this. Thanks for your time. I've been slacking in my monitoring of the Private Sewer and Water Corp, and Ron Janis' shenanigans recently. The holidays have been busy and frankly I've had better things to do that track down all the crap Ron has pulled. So I missed this latest BBB complaint that showed up back in November. Once again Ron didn't bother to respond. I'm guessing when its this obvious that he's in the wrong there isn't much he could say to help matters. BBB Complaint against The Private Sewer and Water Corp. The complaint reads as follows. An all too familiar story for those of us that have had the misfortune of dealing with Ron. Complaint: The week of August 14, 2015, Mr. ***** replaced a broken pipe in our front lawn after a sewer back up. He completed the plumbing work and repaired the lawn as agreed. After I paid him in full by personal checks, he said he messed up an forgot to ask me for an additional $1,000 for a bond from the Village to complete the sidewalk. He assured me the additional $1,000 would be retuned in one month after the sidewalk was complete. I agreed but asked for an agreement in writing showing that I paid in full and my $1,000 would be returned when work on sidewalk was complete. He wrote up an agreement and I signed two copies. I was told I could keep both copies. I found it odd that he didn't want a copy for his files. I didn't realize until after his representative left that the two copies had different amounts on them--one with the actual amount and one with a greater amount. When weeks went by and many phone calls later and the work was not completed, I became suspicious. I went to the Village to check on the bond. They informed me that they had nothing on file for our address. I called Mr. ***** and asked for a copy of the bond or receipt which he claimed he had received from the Village since they had no record. He said he had a copy. Of course, I never received it. He claimed to have been out of town for four weeks and was very busy. I was very frustrated by this time and asked the Village to replace the sidewalk. The missing sidewalk became a safety hazard for the children walking to school and for my husband, who is 85 and has Alzheimer's. Before the sidewalk was replaced, my husband went for a walk in the neighborhood and fell. He had to be hospitalized. I sent Mr. ***** a photo of my husband in his hospital bed with his apparent injuries from his fall, but this did not move him to complete the sidewalk. After many calls and texts from both myself and my handyman who referred him to us, he refuses to return my $1,000 and $287.50 that I paid the Village to replace the sidewalk. All of our call and texts are documented. When Mr. ***** began the sewer repair, he was almost shut down because he did not get a permit. An inspector came and he went to the Flagg Creek Water Reclamation district for a permit dated 8/14/15. However, Mr. ***** used another plumbers name as the Permittee on that permit. I sent a letter to my attorney explaining all of this. He sent a letter to Mr Janis, but got no response. All I request from Ron ***** of Private Sewer and Water Corp. is my $1,000 retuned and the $287.50, the cost for replacing the sidewalk. Desired Settlement: $1,000 owed to me per our agreement dated 8/19/2015 and $287.50, the cost I paid to the Village to replace two sections of sidewalk. A New Home for the Private Sewer and Water Corp? I just received a call from one my old electrician buddies, and he informed that Ron Janis has managed to find a new shop to operate from. This is for the Private Sewer and Water Company. I am sure there are many people who would like to know where to go to collect their monies or services that is owed to them. Me included. I'll be paying him a visit tomorrow. The address is 854 N Ridge Ave, Lombard, IL 60148. From the sounds of it, It is a very small unit. I am shocked to hear that someone else has actually rented to this guy considering his history. It's kind of sad actually, it's too bad no one was able to warn the landlord of this guy and that he will soon be swindled out of thousands of dollars. And as of this past Saturday, his new store at 9 S Park Avenue has a sign on it that reads, "Opening Mid November!!!" How perfect is that? He can't even help but to lie about that as well. You would think he would change or take down the sign after mid-November has come and gone. I guess he managed not to get evicted from his new plumbing location. I wonder how many people he had to rip off to cover the back rent for that?